This nautical-themed key chain is both adorable and functional, featuring brass binoculars as a key fob. Crafted from solid brass, this key chain is as beautiful as it is durable and functional with a knurled knob that allows you to easily and securely add or remove keys from the ring. These wonderful key chains make ideal gifts for all. Created soon after some of the earliest telescopes, the earliest patent applied for in 1608, binoculars have become a common tool in personal, nautical, and military life. 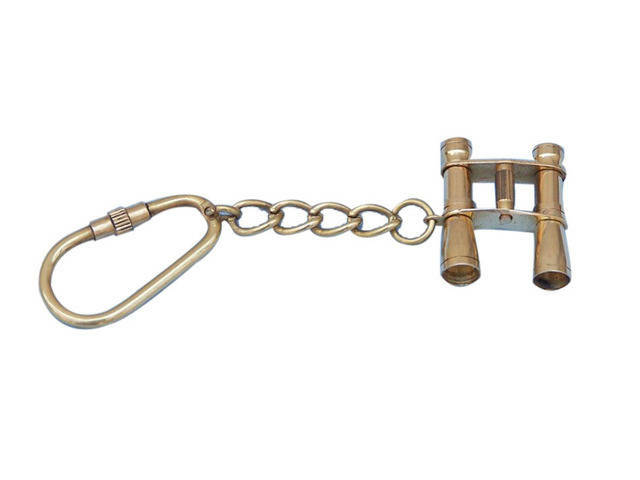 The binoculars on this brass key chain depict a design that is practically unchanged since the 19th century. The first binoculars, much like telescopes in the 1600s, used quartz crystal as the focusing devices, producing blurry and unreliable images. It wasn’t until the mid-1800s that modern optics were implemented, creating the binocular design we now know and the one reproduced on these brass key chains. In 1854 the Porro Prism was developed by Ignazio Porro, using a double prism design that bent light in a Z-pattern, and in the 1880s the Roof Prism created a narrower and more compact design that was more utilitarian. In 1894 the first of what can be considered a modern pair of binoculars, very similar to the basic design on this brass key chain, was created and sold. Prior to this design Ernst Abbe, an optics designer, had worked to produce clearer and more precise images. In a venture with master glassmaker Otto Schott and instrument maker Carl Zeiss the trio produced a pair of binoculars that became the standard bearer. Throughout the next century binoculars continued to advance, from the 15 meter, 10 ton naval rangefinders of World War II, to amazingly powerful handheld versions. These brass key rings feature a classic design, used by sea farers and nautical enthusiasts, and provide a little reminder of the amazing history behind this amazing tool. Put your keys on this brass key chain, pick up your pair of binoculars, and gaze out into the distance and the future.